Showcase your displays with Hello Sunshine Poms Scalloped Borders! 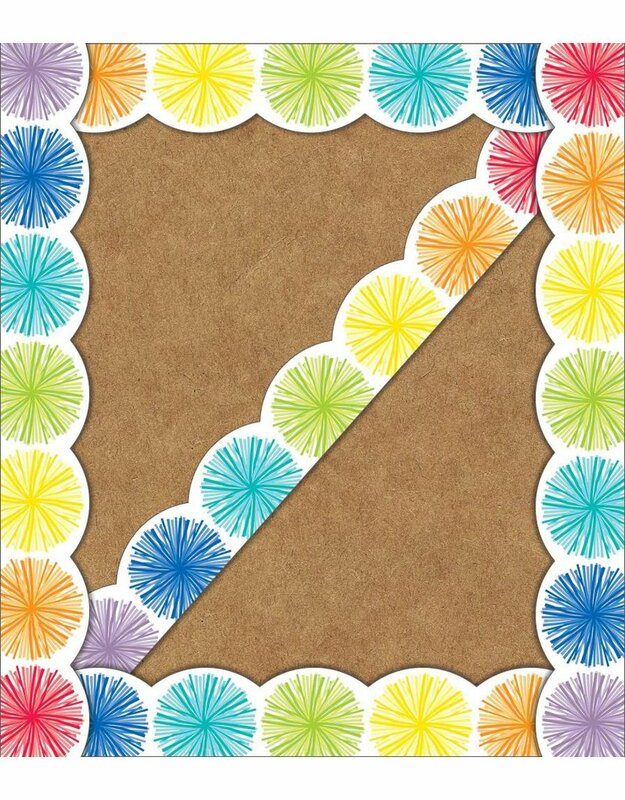 These borders feature cute pom-pom designs in assorted bright colors. This border pack includes 13 strips—each measuring 3' x 3" for a total length of 39'. --With Carson Dellosa’s easy-to-customize classroom borders, creating unique displays is fun and easy. Cut and layer borders to add dimension or use individually for a classic style. Be sure to check out other Hello Sunshine products to complement your classroom theme. --Schoolgirl Style’s line of trendy classroom accessories helps to take the guesswork out of styling and managing classroom design. Each collection, designed by Melanie Ralbusky, offers a signature look that will transform empty spaces into extraordinary spaces for students to enjoy. The variety of décor options in the Schoolgirl Style collection makes it possible for anyone to design and decorate classrooms that inspire learning and joy!